Arrows indicate abnormalities on MRI brain scans in children with no symptoms of multiple sclerosis. 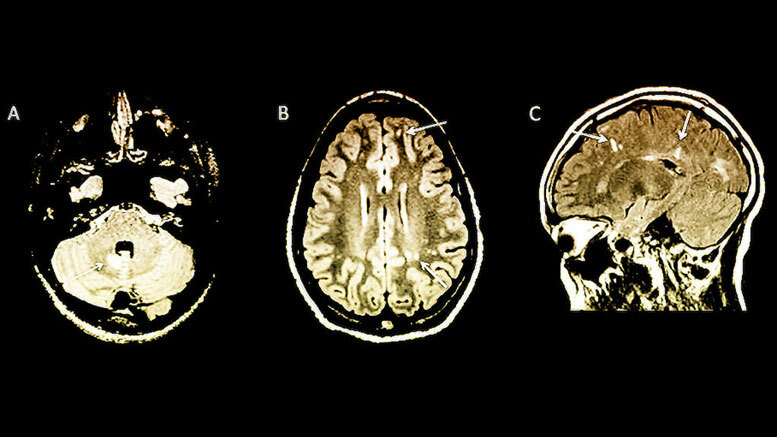 Researchers detail how MRI brain scans can identify children at high risk of developing multiple sclerosis before symptoms appear. “We hope that our work will help inform expert guidelines for how to follow up children with RIS and help us accurately inform families of the risk of later developing multiple sclerosis, something we were previously unable to do,” said Makhani. The study was funded in part, by Yale’s Clinical and Translational Science Award from NIH (CTSA grant UL1TR000142 from the National Center for Advancing Translational Science [NCATS]). Be the first to comment on "Researchers Use MRI Brain Scans to Reveal MS Risk in Children"